What is "literature?" The answer to this question may seem self-evident to us now. However, the production of literature as a category was in fact a very complex historical process that engaged with varying forces of modernity. 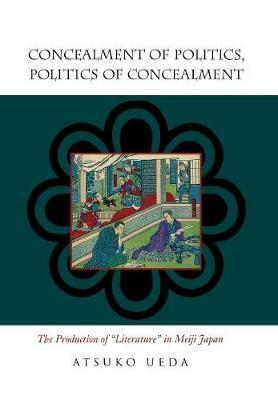 Concealment of Politics, Politics of Concealment illuminates the large picture of intellectual, political, and literary culture of 1880s Japan and offers a paradigm-shattering discussion of the creation of literature as a cultural category. Literature emerged out of ongoing negotiations with modernizing and globalizing impulses that governed Meiji Japan (1868-1912). This complex process is too often concealed by literary studies that assume that Japanese literary modernity began with Tsubouchi Shoyo's The Essence of the Novel (1885-6). This view has long confined the discussion of literature to very narrow terms. By recasting the Shoyo's work in the political and intellectual domains, Concealment of Politics, Politics of Concealment not only explores the interaction of different discourses in 1880s Japan but offers a rigorous critique of our own approaches to the history of modern Japanese literature.